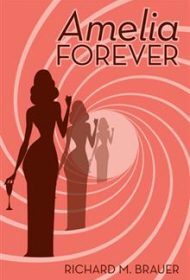 Richard M. Brauer’s Amelia Forever, is a murder mystery that initially centers on Norm Withers, a retired detective with the Seattle police force, who is recovering from a brutal car accident. Norm shares a hospital room with an elderly man named George Armstrong. Ever the detective, Norm notices that George’s much younger wife, Amelia, looks suspiciously like the wife of a man by the same last name whose mysterious bathtub drowning Norm investigated 32 years earlier. But that woman was in her 20s then, as is George’s wife now. Norm points out the strange coincidence to his son, Dave, also a detective, and urges him to do some digging. But soon, George Armstrong dies while alone with Amelia, and after Norm asks the staff to look into it, he suffers a similar fate. Dave is now convinced his father was right about this woman and seeks to uncover her background. Along the way, he wins the lottery, meets beautiful women, and is introduced to the supernatural world of the immortal. From almost the beginning, there’s the sense that the plot has been cobbled together from several unrelated stories. It’s a mix of odd elements, including nonsensical character names (e.g. Merry Hoofer and Shirley Ujest), plot twists with no real bearing on the larger story, incomplete backstories and implausible happenings. In sum, with unsympathetic characters, stilted dialogue and an often-baffling plot, Amelia Forever is unlikely to appeal to a wide audience.